Comfort Blue Skies Fabric Conditioner 1.26L provides clothes with a fresh smell, exceptional softness and a fantastic fragrance. Extra freshness with a soft touch (versus concentrated Comfort Pure). Protects clothes against unwanted odours with Comfort?s longlasting odour protection formula. Softens fabric fibres to leave clothes feeling soft and gentle on your skin. Regular use promotes fast drying clothes and makes your clothes easier to iron. Use with your favorite laundry detergent. 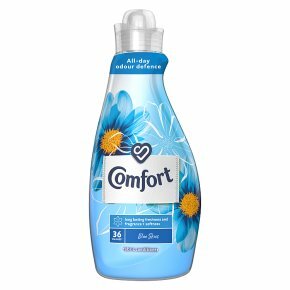 Comfort Blue Skies Fabric Conditioner 1.26L. Treat your family to the delightful feeling of outdoor freshness with Comfort Blue Skies Fabric Conditioner 1.26L. Make your favorite clothes smell and feel great with extra freshness with a soft touch, thanks to Comfort?s special odour protection formula. Not only does our fabric softener provide your clothes with exceptional softness and a fresh-smelling fragrance, it also saves you time by making your clothes easier to iron and promoting fast drying clothes. Make Comfort Blue Skies a part of your regular laundry routine and open the door to a world of brilliant fragrance and softness. How to use: Pour a 35ml dose of Comfort Blue Skies Fabric Conditioner 1.26L straight into the correct compartment of your washing machine drawer along with your favorite laundry detergent. Do not pour directly on to fabrics. Choose the correct wash setting and let your machine take care of the rest, as it releases the fabric softener during the final rinse cycle. Using Comfort fabric conditioner in every wash helps smooth fabric fibres, maintains garment colour and shine, and keeps your family?s clothes looking and feeling their best. Thanks to our innovative odour defense formula, Comfort Blue Skies Fabric Softener provides odour protection against bad smells ? delivering extra freshness with a soft touch, keeping your favorite garments smelling fresher for longer and giving you that laundry-fresh feeling all day long.